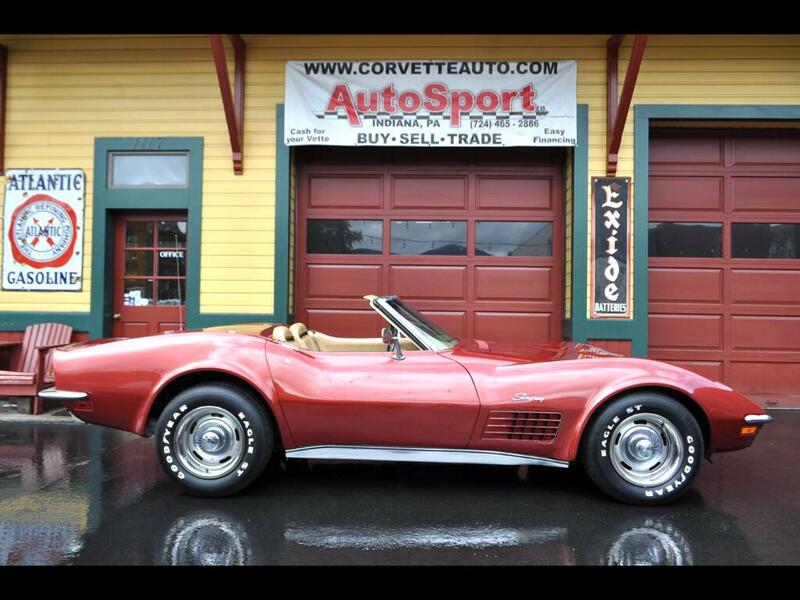 Used 1970 Chevrolet Corvette 1970 350hp 4sp California Corvette Convertible! for Sale in Indiana PA 15701 AutoSport Co. Trim: 1970 350hp 4sp California Corvette Convertible! 1970 Corvette Convertible 350ci 350hp #'s Matching 4-speed with an extremely rare color combination, Marlboro Maroon w/ a Beige interior! This car has spent most of its life in sunny California and is a solid Corvette! The previous owner has had the suspension completely restored and there are various receipts documenting the work done. This 1970 Roadster Corvette is loaded with factory options and they include; 350ci 350hp Engine, 4-Speed Manual Transmission, Power Steering, Power Brakes, Power Windows, Marlboro Paint, Beige Interior, AM-FM Stereo, and White Lettered Tires! The Corvette Bronze Paint looks great w/ Beige interior. The paint is in good condition with a bright clean finish. The body is original in excellent condition with clean smooth consistent lines, nice gaps, and a nice fit and finish overall. The interior is in excellent condition with new seat covers. The gauges and dash are in excellent condition. The soft top and frame are in good condition as well. The chrome bumpers look good and have a mirror chrome finish. The frame is exactly what you would expect to see from California car, it’s in excellent rust free solid condition. The previous owner had the whole suspension restored and it is new. This Corvette overall is a great driver with the last year for the big horsepower! The color combination is ultra-rare because it did not come standard in this combination, it had to be special ordered. Please feel free to call us at 814-977-9219 or email us with any questions. Message: Thought you might be interested in this 1970 Chevrolet Corvette.